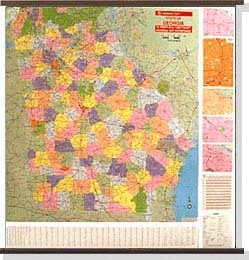 The special features found on the new Georgia State wall map are as follows: all state highways, cities, wildlife areas, major waterways, all federal highways, towns, military installations, state parks, major airports, state universities, and various points of interest. Inset maps of major cities include Atlanta, Albany, Savannah, Macon, and Augusta. The map is indexed on face of map. Its scale is approximately 1" = 9 miles.